﻿ How to Measure the Business Impact of Your Email Marketing » Red Mango Marketing! Research from the Direct Marketing Association has shown that email marketing returns $44 for every $1 spent. Do you know if this return on investment rings true for your small business? If you don’t know the answer, it’s okay, you’re not alone. Many small business owners we talk to just aren’t that excited about digging into email marketing reports. But when they see the connection between their email marketing activities and real business results, things start to get a lot more exciting. Use these worksheets to tie your email marketing activities to business results. If you’re using Constant Contact for email marketing, you’ll be able to look at the performance of your individual emails, see how well your emails perform on average, benchmark your email results to industry averages as well as against your own averages, and compare two email campaigns against each other. But there’s another metric that doesn’t reside within your email marketing reports and that’s business result. So we’ve created some handy-dandy worksheets for you so you can get a better understanding of how your email activities are bringing real results to your business. 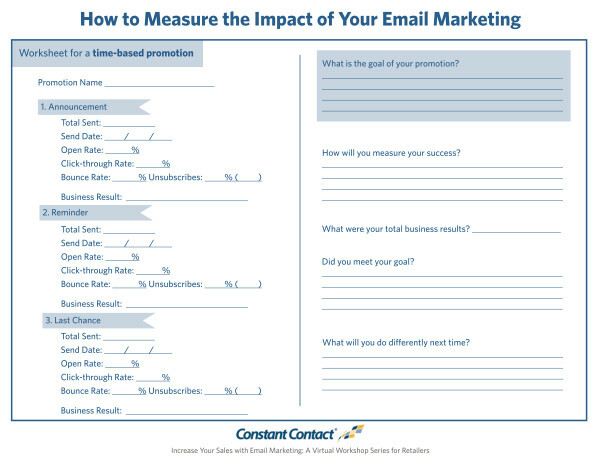 Use your worksheets to follow along below and be sure to join us on, Thursday, April 28 at 2pm ET for Part 4 of our Virtual Workshop for Retailers: How to Measure the Impact of Your Email Marketing. Register even if you can’t attend live and we’ll send you a link to the recording. Why bother doing this exercise at all? Beyond seeing the direct impact email marketing is having on your business, you’ll also start to identify trends allowing you to make smarter decisions about your email marketing efforts. The announcement email had the highest open rate but only generated a few sales. The reminder email had a lower open rate than the announcement but also generated a few sales. The last chance email had the lowest open rate but generated the most sales. If the owner were looking only at his open rates he might decide that he shouldn’t send the last chance email at all. But by including the business result in his analysis he can see that’s where the majority of his sales came from. By analyzing his reports, the bike shop owner, now understands the importance of sending the full series of emails. Even though, initially, he thought he might be sending too much, by filling in his worksheet he’s able to see that people often don’t take action in the first email and need to be reminded to act and buy something. So, if he only sends one email instead of three, he’s likely to be losing sales in the long run. You can start making smarter marketing decisions too. At this point, you’ve sent your email(s) and now you’re probably wondering how you did and how you can do better in the future. Let’s take a look at how to use your worksheet to help you get a sense of how email marketing is helping your business and see if there are any adjustments to be made to future emails. You’ll see we have a separate worksheet for each of the two types of emails. You’ll follow a similar process for filling out the worksheets. Here we’ll take a look at the worksheet for a time-based promotion. Start by writing in the name of your promotion. Then open up the reports section of your Constant Contact account. Fill in the details for each of the emails you sent as part of your time-based promotion series. You should have sent three emails: An announcement, a reminder, and a last-chance email. Total Sent: The total number of contacts you sent your email to. Send Date: The date you sent your email. Open Rate: The percentage of contacts who opened your email. Click-through Rate: The percentage of people who clicked on a link within your email. Bounce Rate: The percentage of emails that didn’t make it to the intended recipient. Unsubscribes: These are the people who decided to no longer receive your emails. Enter both the percentage and raw number of people. Business Result: Here you’ll enter the number of business actions that resulted from the email. For time-based promotions, this could mean things like registrations, attendance, payment status, revenue, number sold, new customers, or repeat customers. For non-promotional emails, beyond the email engagement, you’ll look at things like response rate, completion rate, video views, downloads, website visits, social engagement, reach, or an increase in followers. Now you’ll be able to see the performance results for each of your emails in one location so you can see how each email in the series compared to each other and get a sense for your total business results. Take a look at the right side of your worksheet. What is the goal of your promotion/email? This is where you’ll enter what you wanted people to do when they received your email. This is typically your call-to-action request. How will you measure your success? The answer to this question should map to your goal. If you asked people to read a blog post, you’d measure your success based on your click-through rate and visits to that particular page on your website. What were your total business results? This is where you’d enter the total from all the emails sent. Enter any pertinent information here, such as total number sold and total revenue. You may find this information in other systems such as Google Analytics, your point-of-sale software, or by manually tracking them. Did you meet your goal? Looking at your overall results, how did your campaign perform based on your expectations? What will you do differently next time? Jot down any ideas you have for making adjustments next time. What are you noticing from your worksheets? We already mentioned how the bike shop owner noticed how the time-based promotion email series impacts his sales. You may also notice things like high email engagement but low sales. This could indicate that you should look at your offer. Is it the right offer? Is there something in the sales flow stopping people? Of course, there’s much more you can uncover. But you’ll have to join us on, Thursday, April 28 at 2pm ET for Part 4 of our Virtual Workshop for Retailers: How to Measure the Impact of Your Email Marketing, (register even if you can’t attend live and we’ll send you link to the recording,) to learn more about what your reports and analytics are telling you and how to make adjustments for the better. 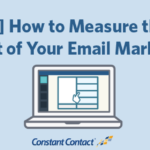 The post How to Measure the Business Impact of Your Email Marketing appeared first on Constant Contact Blogs. This entry was posted on Wednesday, April 27th, 2016 at 9:30 am	and is filed under Email Marketing, News & Updates, virtual workshop for retailers. You can follow any responses to this entry through the RSS 2.0 feed. Both comments and pings are currently closed.